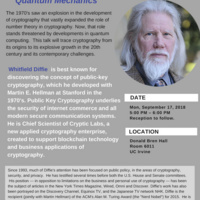 Public Lecture by Whitfield Diffie. The 1970's saw an explosion in the development of cryptography that vastly expanded the role of number theory in cryptography. Now, that role stands threatened by developments in quantum computing. This talk will trace cryptography from its origins to its explosive growth in the 20th century and its contemporary challenges.